The conventional helicopter design consists of a main rotor which provides lift for the aircraft as well as control over pitch and roll (i.e. elevator and aileron). The force generated by the motor which pushes the main rotor blades through the air has an equal and opposite reaction on the rest of the airframe which is twisted in the other direction. The anti-torque rotor (or tail rotor) is designed to provide the thrust necessary to resist this motion; without it the aircraft would spin uncontrollably. During his early research work in the late 1960’s Dieter SchlŸter, the first person ever to successfully fly a radio controlled helicopter, realised that controlling the tail was a task better done automatically. Therefore he looked for some method of adjusting the tail rotor pitch control (more commonly known as the rudder) electro-mechanically. The device he came up with was the forerunner of all early gyros and consisted of a spinning aluminium wheel mounted on a gimbal in such a way that when the unit was rotated the gyroscopic precession would cause the gimbal to tilt. Attached to the gimbal was a metal vane which passed between a small electric bulb and a photoresistor. When the gyro/gimbal assembly moved (due to a yaw movement of the helicopter) the vane moved and allowed light to fall on the photoresistor. The signal from the photoresistor was then electronically mixed into the signal going to the rudder servo to give the tail rotor more or less thrust as required. The higher the rate of rotation the greater the correction applied by the servo. This was a very basic negative-feedback system and worked well enough to allow Dieter to fly his early models fairly successfully. However, gyros were not commercially available and many of the early heroes of our sport learned to fly the hard way – with no tail stabilisation at all! Fortunately, before long Dieter’s design was developed and refined by manufacturers such as Sanwa, Futaba, Quest, Century, Morley, KO and Kraft to produce mechanical gyros with quite a good level of tail control. An early feature of these gyros was a function which allowed the pilot to adjust the degree to which they would correct changes in yaw. This is known as the ‘gain’ of the system and as we’ll see it is still an important feature today. There were several problems with these early mechanical units one of which was the fact that the pilot was always ‘fighting’ the gyro. Every time the rudder control was used to turn the helicopter to the left or right the gyro would oppose the motion and this limited the yaw rate available. A solution was the ‘Pilot Authority Gyro’ which automatically reduced the gain of the gyro in proportion to the amount of rudder applied. In the middle of 1994 Colin Mill was working at the University of Manchester Institute of Science and Technology (UMIST). He was a keen RC helicopter pilot and in his spare time had written the popular CSM flight simulator program. However, when flying the real thing he had always been frustrated in his attempts to do backwards loops and rolls because the tail would always step out of line. This was despite the fact that he was using a Futaba 154 mechanical gyro – state of the art technology at the time. He was sure that there was a better solution and so after some thought he wrote an article in Model Helicopter World magazine in which he laid out his ideas for the future of gyro stabilisation. Colin described a new type of device that would take control of the tail completely. The pilot would no longer control the tail servo, as with all designs up to that point. Instead moving the rudder stick would tell the gyro what rate of turn was required and it would do the rest. This is a fundamental characteristic of all modern gyros and represented a huge step forward. Furthermore, this design disposes of the need for ‘revo mixing’ and means that the gyro will move the servo to whatever position is required to maintain the required rate of turn and lock it there – in other words, this was a design for the Heading Lock (sometimes known as Angular Vector Control System or AVCS) gyro as we know it today. In retrospect it’s surprising that, having described a product with such amazing potential, none of the existing manufacturers paid any attention. Eventually, seeing no one taking up his idea Colin decided to develop the product himself. He started design work in November 1996, preferring to use the new ‘solid state’ piezo gyros that had become available (more about these later) rather than the established mechanical system. By December that year he had a working prototype which he took to British expert pilot Bob Johnston for an opinion. Bob’s exact response to the bizarre way that the tail servo moved with the new gyro cannot be repeated here but suffice to say that it worked and within a few months Colin took his new product, the CSM 360, into production. The rest, as they say, is history and the heading lock (or heading hold) gyro has now become an almost universally accepted component in radio controlled helicopters. Furthermore, Colin’s idea is widely regarded to be the invention that made the sport of 3D flying possible. Having looked at the history let’s take a look at some of the components of the heading hold gyro and see how they work. Gyros consist of either a single unit, such as the CSM 720 or as two separate units such as the Curtis Youngblood ‘Solid G’. However, the fact that these components are separated for convenience makes no difference to the way they work. 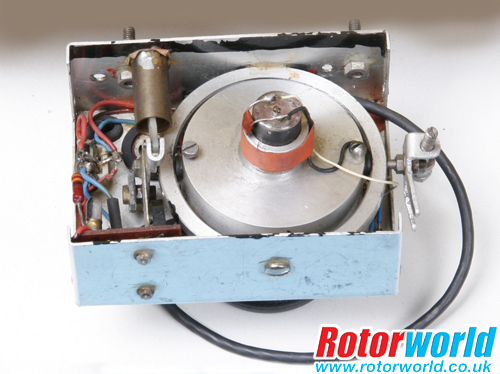 The Sensor – Arguably the most important component in a gyro is the sensor which detects rotation in a particular axis. When mounted in the helicopter, the axis of the sensor must be parallel with the main shaft of the helicopter so that it detects movement in that axis. (Contrary to popular opinion it does not have to sit under or close to the main shaft.) All modern sensors employ a device called the ‘vibrating structure gyroscope’ which was originally developed for the video camera market. A good way to visualise this component is as a tiny ‘tuning fork’ in which a microscopic structure made from silicon or a ceramic material is made to vibrate, either using a piezo electric device (in older/less sophisticated models), electrostatically (as with CSM gyros) or magnetically (as with JR and Futaba). When the helicopter is not yawing the tines of the tuning fork vibrate back and forth in a straight line as you would expect. However, if the helicopter starts to rotate in an axis parallel with them, the tines attempt to stay vibrating along their original path and so, in relation to the rest of the gyro (which has moved a little with the rest of the helicopter) they will seem to have moved slightly. For the physics buffs this is known as the Coriolis Effect. Amazingly, the gyro is able to detect this apparent movement in the tines and convert it into a signal that can be processed by the microcontroller. As mentioned, not all sensors are the same and the different ways in which the vibrating structure is controlled have interesting side effects which pilots should be aware of. For example, CSM sensors (which use electrostatic actuation) are affected by the high static electrical charges sometimes generated by tail rotor belts. When this happens pilots will notice that their tail twitches every few seconds – a problem that can be solved by spraying the tail rotor belt with some form of anti-static spray – Mr Sheen is my favourite! The sensors in Futaba and JR gyros tend not to suffer from electrostatic problems – they use magnetic actuation and are therefore sensitive to magnetic fields instead. For this reason it’s a good idea to ensure that they are kept away from wires and other equipment that carries high currents such as servos. PID Loops – A fundamental part of many electronic control systems is the PID control loop feedback mechanism. If this sounds complicated that’s probably because it is! PID stands for ‘Proportional Integral Derivative’ and is the mathematical model that engineers use in all sorts of control systems from thermostats in central heating systems to cruise controls in cars. Put simply it’s a way of taking appropriate corrective action to rectify an error by looking at what is happening to the system now and taking into account what has happened in the past. A simple example is when you adjust the temperature in the shower. If it’s too hot you have to judge how much to turn the temperature down to get it right. If you turn it too far you will have to turn it back again but not quite so far. Humans are very good at this sort of thing but getting machines to do it requires some mathematics that I won’t cover here. Suffice to say that with most gyros the pilot has control over one of the parameters in these equations and this is called the ‘gain’. Gain control – The gain is the degree to which the gyro will attempt to correct a positional error. If it is set too high the tail will wag, too low and the tail will seem sloppy and unresponsive. The gain control often causes confusion with beginners because the transmitter channel allocated to it normally has two functions. That’s right, one channel with two functions! There’s not really enough space here to describe how it does this – look in your gyro manual for details – but for completeness I’ll briefly describe what this second function does. There are two available modes with most gyros – ‘Heading Lock’ and ‘Normal’. We’ve already discussed heading lock – normal mode is a gyro setting where the it will resist unwanted yaw but will not make corrective adjustments to put it back where it should be. This means that a helicopter in normal mode will tend to ‘weather vane’ or point into the wind – a feature some pilots can sometimes take advantage of in certain situations although most only ever fly in heading lock mode. There is an enormous amount that one can say about gyros and I’ve only really scratched the surface in this article. However, before finishing it’s worth saying a word or two about cyclic stabilisation. I’ve already covered the fact that modern gyros enable the pilot to determine the rate of rotation around an axis but so far we’ve only covered yaw. Helicopters can also rotate around the two (cyclic) axes – elevator and aileron. As pilots we take for granted the stabilising characteristics of the fly-bars on our RC helicopters but it takes energy to drive them through the air and the degree to which they stabilise the aircraft cannot be adjusted in flight. So why not use gyros instead? The possibilities of such a system have not been lost on engineers who have produced several systems to do just that, notably CSM (who use two of their 720 gyros programmed to suit the requirements of cyclic stabilisation) and Mikado who produced an excellent integrated 3-gyro system. These systems are a real boon for scale pilots who can use them to eliminate the unrealistic fly-bars from their models.